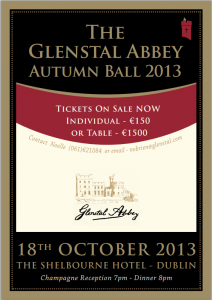 The Glenstal Abbey Autumn Ball (Black Tie) will take place at the Shelbourne Hotel, Dublin, on Friday 18th October, 2013. Funds raised will be used to fit out Social Spaces in our new school building, to be named in memory of the late Anne O’Reilly, Matron 1953 – 1992 and to honour Abbot President, Celestine Cullen OSB – Headmaster 1961 – 1979. • Premium Table of 12 will be located in a first tier seating position plus advertising and recognition opportunities. • Advertising Opportunities are also available.